This September 2015 publication from Global Financial Integrity is the summation of a great partnership with the Ford Foundation. 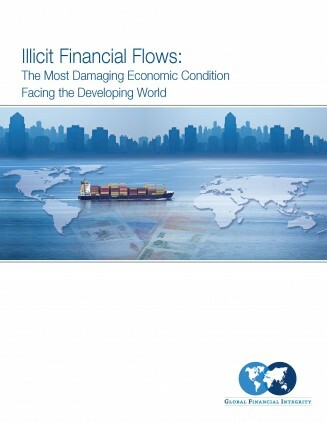 The book features five condensed and updated quantitative country studies on illicit financial flows (IFFs) from India, Mexico, Russia, the Philippines, and Brazil by GFI Chief Economist Dr. Dev Kar, as well as chapters written by GFI President Raymond Baker and Managing Director Tom Cardamone. Dr. Thomas Pogge, Leitner Professor of Philosophy and International Affairs at Yale University, writes on the human rights impact of illicit financial flows. The relationship between illicit flows and development is considered by Erik Solheim, the chair of the OECD’s Development Assistance Committee. Raymond Baker is the President at Global Financial Integrity and the author of Capitalism’s Achilles Heel: Dirty Money and How to Renew the Free-Market System.He has for many years been an internationally respected authority on corruption, money laundering, growth, and foreign policy issues, particularly as they concern developing and emerging economies and impact upon western economic and foreign interests. He has written and spoken extensively, testified often before legislative committees in the United States, Canada, the European Union, and the United Kingdom, been quoted worldwide, and has commented frequently on television and radio in the the United States, Europe, Africa, Latin America, and Asia. Mr. Baker is a member of the High Level Panel on Illicit Financial Flows from Africa, chaired by former President of South Africa Thabo Mbeki. He also serves on the World Economic Forum’s Council on Transparency and Anti-Corruption. He also serves on the Board of Directors of the Center of Concern and on the Policy Advisory Board of Transparency International-USA. Tom Cardamone is the Managing Director of Global Financial Integrity (GFI). For two decades he has been an analyst, Project Director and Executive Director for, and a consultant to, several non-profit organizations. Prior to joining GFI, Cardamone was a consultant to non-governmental organizations in the areas of strategic organizational and program planning, development and web site content. From 2000 to 2003 he was Executive Director of the Center for Arms Control and Non-Proliferation, a leading Washington, D.C.-based arms control organization. During his career Cardamone has advocated numerous policy positions on television, radio and in print media including appearances on CNN, Canadian Broadcasting and Swiss Broadcasting and in newspapers including The New York Times, The Wall Street Journal, and The Washington Post. Dev Kar is the Chief Economist at Global Financial Integrity. Prior to joining GFI, Dr. Kar was a Senior Economist at the International Monetary Fund (IMF), Washington DC. During a career spanning nearly 32 years at the IMF, he worked on a wide variety of macroeconomic and statistical issues, both at IMF headquarters and on different types of IMF missions to member countries (technical assistance, Article IV Consultations with member countries, and Use of IMF Resources). He has published a number of articles on macroeconomic and statistical issues both inside and outside the IMF. Dr. Kar has a Ph.D. in Economics (Major: Monetary Economics) and an M. Phil (Economics) (Major: International Economics) from the George Washington University and an M.S. (Computer Science) from Howard University (Major: Database Management Systems). His undergraduate degree in Physics is from St. Xavier’s College, University of Calcutta, India. Thomas Pogge is the Director of the Global Justice Program and the Leitner Professor of Philosophy and International Affairs at Yale University. Having received his Ph.D. in philosophy from Harvard, Thomas Pogge has published widely on Kant and in moral and political philosophy, including various books on Rawls and global justice. In addition to his Yale appointment, he is the Research Director of the Centre for the Study of the Mind in Nature at the University of Oslo, a Professorial Research Fellow at the Centre for Applied Philosophy and Public Ethics, and Adjunct Professor of Political Philosophy at the Centre for Professional Ethics of the University of Central Lancashire. Pogge is also editor for social and political philosophy for the Stanford Encyclopedia of Philosophy and a member of the Norwegian Academy of Science. With support from the Australian Research Council, the UK-based BUPA Foundation and the European Commission (7th Framework) he currently heads a team effort towards developing a complement to the pharmaceutical patent regime that would improve access to advanced medicines for the poor worldwide and toward developing better indices of poverty and gender equity. He is also president of Academics Stand Against Poverty, an international professional association focused on helping poverty researchers and teachers enhance their positive impact on severe poverty. Erik Solheim took the lead of the main body of world donors the OECD Development Assistance Committee (DAC) in January 2013. He is also serving as United Nations Environment Programme’s special envoy for environment, conflict and disaster. From 2007 to 2012 he held the combined portfolio of Norway’s Minister of the Environment and International Development; he also served as Minister of International Development from 2005 to 2007. During his time as minister Norwegian aid reached 1%, the highest in the world. Solheim has focused on fragile states, encouraged use of New Deal principles and worked to align DAC-donors behind state building and peace processes in war torn countries. From 2000 to 2005, Mr. Solheim was the main negotiator in the peace process in Sri Lanka. As minister he contributed to peace processes in Sudan, Nepal, Myanmar and Burundi. Erik Solheim cites as one of his most important achievements his role in establishing the UN REDD, the global coalition to conserve the world rain forests. He has received several awards for his work on climate and the environment, including UNEP’s “Champion of the Earth” award. The authors wish to thank and acknowledge Christine Clough (Program Manager and Acting Communications Director), Joseph Spanjers (Junior Economist), Channing May (Policy Associate), Loosi Azarian (Administrative Assistant), Uyen Le (Economics Intern), Yuchen Ma (Economics Intern), Sophie Haggerty (Communications Intern), and Emily Armstrong (Policy Intern) for their contributions to the production of this report. GFI and the authors would also like to acknowledge Gil Leigh of Modern Media for his contributions to the layout and design of the publication and Jennifer Nordin for her contributions to the editing of the publication. Funding for this report was generously provided by the Ford Foundation.